These are accurate three dimensional reproductions of the teeth and surrounding soft tissues of the patient's upper and lower jaw. Because these casts show a three-dimensional view of the condition existing in the mouth before, during and after the treatment, they are a particularly valuable diagnostic tool. Using diagnostic casts also allows the dentist to study the patient's mouth from angles usually impossible during a clinical examination. Different types of X-rays can be taken for diagnosing or assessing teeth. The x-rays and/or records are taken based on the existing dental problem and the view of the teeth required by the dentist. 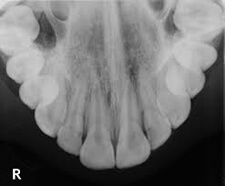 Periapical radiographs record images of the entire length of 2-4 teeth and 3-4 mm of supporting tissues beyond the root. These are used to interpret normal anatomy and pathology in and around the tooth. A bite-wing view shows images of the upper and lower teeth on the same film, especially the areas between the teeth. Root structure is not visible on these films. 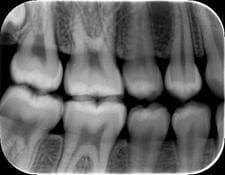 This type of radiograph is particularly useful for detecting decay occurring in between teeth. Occlusal radiographs record images of one entire jaw on a single film. 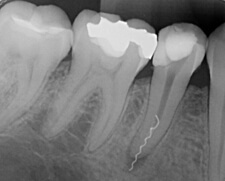 This type of radiograph is useful for locating supernumerary (extra), unerupted and impacted teeth. The OPG gives the complete X-ray picture of all the teeth, the upper and lower jaws, the sinus and the temperomandibular joint i.e. the jaw joint. 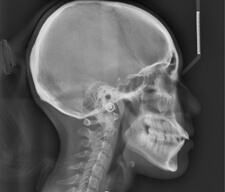 Such X-rays are useful in Orthodontics, diagnosis of jaw problems and dental problems involving more than a few teeth. This is a lateral view of the entire skull which gives the picture of the complete head in a lateral aspect. It shows the relationship of the upper jaw with the lower jaw and is used to assess a patient's profile and to assist in predicting growth patterns. 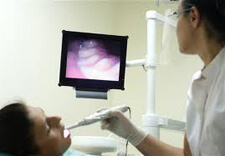 An intra-oral imaging system is similar to a miniature video camera which may be used as a diagnostic aid, record storage and patient education tool. The camera is used to record a full face or smile view before and/or after treatment. In addition, the system may digitize the pre-treatment photograph and morph it into the post-treatment result without actually carrying out the procedure. The camera can also be used intra-orally at high magnification, primarily as a diagnostic aid to view all the hard-to-see areas of the mouth. The captured images can be stored for future reference. Photographs/slides capture the color, shape, texture and characteristics of intra-oral and extra-oral structures. Photography is also useful as an aid in patient identification, treatment planning, case presentation, case documentation, patient education and instruction. It is also important for evaluation of post treatment result. Computer Tomography, also known as CT scanning, is a method by which the computer constructs two-dimensional accurate cross-sectional images of the body. The dentist uses the CT report in the diagnosis of pathologic conditions and in the planning of implant placement in the jaws.